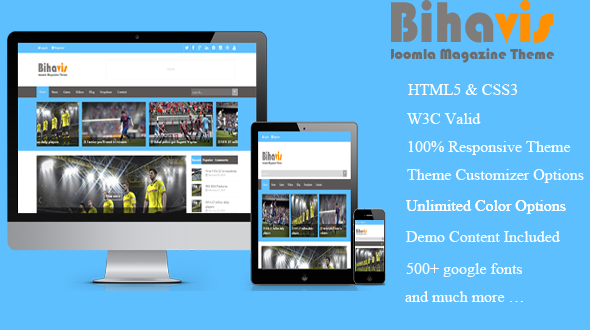 Bihavis is a premium Joomla theme with flat and modern design. It is created for the magazines, news and blogs sites but due to its superb flexibility, it allows you to create the websites for any other purpose. It features very clean and responsive design, which looks very good on any device, This theme is fully responsive and has been tested on Macs, PCs, iPads, iPhones and Androids. The Template include lots of options for the typography, theme colors, homepage and many other settings. You can include the image sliders in any post or page. You can also set any video as post thumbnail simply with its embeding code. This News Responsive Joomla Template suits to all devices, from smartphone, tablet to desktop. More than 100 fonts to customize your site. You don’t need to install this or that to do things. Every modules, pages made by K2. We deeply over-wrote K2 modules, component to make it works out-of-box for you. Use featured images or videos. Use colors of your choice. If you have any questions that are beyond the scope of this help file, please feel free to email via my user page contact form here. Thanks so much! !